Fix it in post: higher resolution, less time. The arrival of HD led to an explosion of digital content. Today, not satisfied with even 4K resolution, the industry is moving inexorably toward 8K and beyond. With burgeoning immersive storytelling driving 360-degree / 3D content, high frame-rate, innumerable episodic and unscripted shows on fast release cycles and ever-more visually stunning cinematic features, data volumes are increasing exponentially. Microsoft Azure stands ready with the storage acceleration and capacity to accept your most expansive projects. The new Azure FXT Edge Filer caching appliance delivers higher scalability and performance than ever before, with high-speed memory, SSD and support for Azure Blob storage. 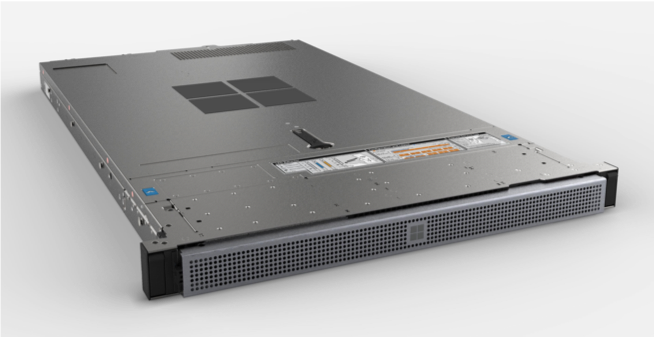 It’s a great fit for high-throughput, low-latency applications such as rendering where you need ultra-fast connections between on-premises storage and cloud compute capacity. We believe our Edge Filer appliances are a major differentiator for customers, and they agree – Avere vFXT for Azure has enabled visual effects studio Mr. X to recently render a feature-length film in Azure. And speaking of rendering, our new Azure Render Farm Manager Portal preview makes it much faster and easier for customers to set up hybrid or cloud-only rendering environments in Azure, including networking setup and Azure storage options, with support for commonly used render farm managers such as PipelineFX Qube. Whether it’s rendering, visual effects or editing, we offer the price and performance combination you need. And, our partnership with Avid continues to expand, with the company announcing Avid NEXIS: Cloudspaces on Microsoft Azure, enabling our joint customers to ingest, manage, edit, and create content in the cloud. Got content? Get storage. Add AI. Your petabytes of content + our Azure Data Box or Data Boxy Heavy (in preview) = secure, enterprise-grade, cost-effective ingest at scale. Just getting off a shoot and have 10’s of terabytes? Meet Data Box Disk. The same benefits in a portable form-factor for smaller content stores. For those on set there is Data Box Edge, which can pre-process media (e.g., remove blank footage) and efficiently transfer it to the cloud through partners such as Dejero or a private high-bandwidth connection with Azure ExpressRoute Direct 100Gbps. We are also making our global network available to you – through Azure ExpressRoute Global Reach, which lets you effectively build your WAN on the Azure backbone. ExpressRoute Direct 100Gbps and Global Reach will be generally available as of NAB. Once in the cloud, you can use Video Indexer’s award-winning AI capabilities to efficiently extract deep insights. Just in time for NAB, we’ve added an AI-based editor to help you generate fresh content in minutes, improved custom face and language models and additional certifications from ISO 27001 to FedRAMP. These new capabilities, and many more, easily integrate with your existing MAMs and can be used with any application to increase accessibility or create new OTT and monetization experiences. 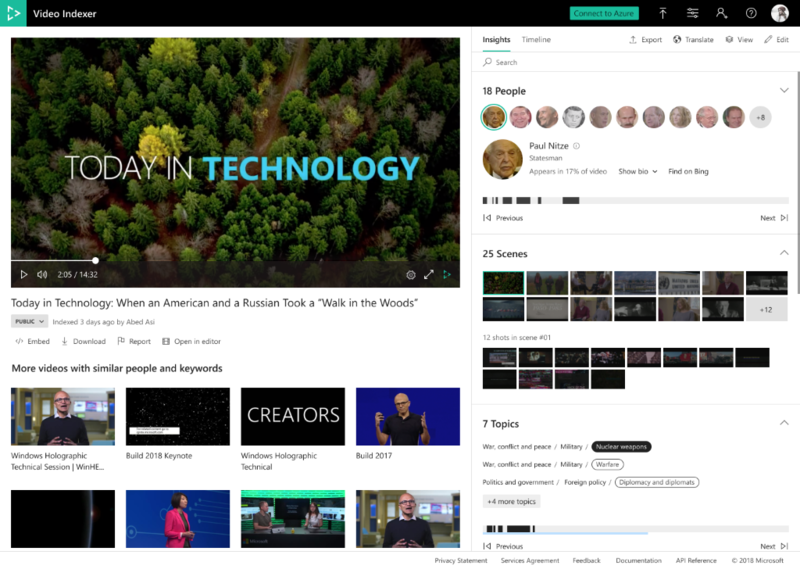 Video Indexer (VI) is part of Azure Media Services (AMS), our hyper-scale, enterprise grade, productive media workflow solution. At NAB we are announcing Dolby Atmos support for our just-in-time media packager and a new content-aware encoding preset that lets you apply custom logic, and seek the optimal bitrate for a given resolution, without extensive computational analysis. From ingest and transcoding to packaging and distribution, Media Services – and our partners – have you covered. You can learn more about these exciting updates and our new private previews for animation, multi-language transcription and live transcriptions here. Harmonic announced that it will make its VOS360 SaaS solution available on Microsoft Azure. Akamai will directly connect its edge network with Azure through ExpressRoute to give customers higher performance and more predictable costs. It also plans to enhance the delivery of live and on-demand workflows with Azure Media Services and our mutual partners. Verizon Digital Media Services is delivering an enterprise-grade streaming platform on Microsoft Azure to enhance video workflows. Haivision’s new media routing cloud service, SRTHub, will help broadcasters more securely and reliably transport live video globally. SRTHub, built on Azure, will also streamline workflow orchestration using an open ecosystem of Hublets from industry-leading partners including Avid, Wowza and Epic Labs. Telestream will bring its industry leading transcoding solution to Azure. Stay tuned for more from Microsoft and partner Harmonic in the coming days. Delivering high-quality and highly available content and applications requires globally-scalable network solutions. To enable our customers to accelerate and deliver superior global applications, we’re announcing the GA of the Azure Front Door Service (AFD). AFD provides a global single point-of-entry that delivers optimized user experiences for web applications. AFD also includes an integrated web application firewall (WAF) and DDoS protection for securing those applications at the network edge. At NAB we’re showcasing how partners such as Zone TV and Nexx.TV are using Microsoft AI and Azure Cognitive Services to create more personalized content and improve monetization of existing media assets. Stay tuned for more in this space as we work across Microsoft to put our data – and insights – to work for you. Visit us at NAB Show 2019 – booth #SL6716 – to learn more, meet with the team and see what our partners have to offer. I hope to see you there – or out there in the real world – and look forward to hearing how we can put Azure to work for you.